Photo: Wahle-Laird House, ca. 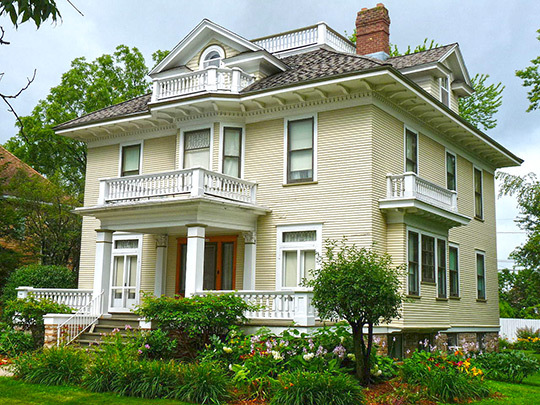 1904, 208 South Cherry Avenue, Marshfield, WI. Listed on the National Register of Historic Places in 1992. Photographed by User:Jeff the quiet (own work), 2010, [cc0-by-1.0 (creativecommons.org/publicdomain/zero/1.0/deed.en], via Wikimedia Commons, accessed July, 2014. The Wood County Courthouse is located at 400 Market Street, Wisconsin Rapids, WI 54495; phone: 715-421-8400. Wood County was created in 1856 from Portage County and is named after Joseph Wood, a state legislator and judge. The Town of Saratoga was created in 1857 and reduced to its present size in 1975. The name is derived from the Saratoga settlement, originally called Ten Mile Creek for the nearby stream. The origin of the name Saratoga is unknown, likely taken from another place in the U.S. named Saratoga. The nationality of the original settlers is diverse and includes: Norwegians, Danish, Swedish, German, Polish and Irish. Many came to the area to establish farms, but eventually found the sandy soil difficult to survive on. Beginning in 1926 and continuing until 1940, a cooperative effort between landowners and the University of Wisconsin resulted in planting thousands of acres of trees. The region's involvement in forestry dates back to 1831 when Daniel Whitney damned the Wisconsin River and built the first sawmill across from the City of Nekoosa, which was known in pioneer days as Pointe Basse. In 1837 Mary and Robert Wakely built a house/hotel/tavern in Pointe Basse that became a haven for travelers. The Tavern still stands and is listed on the National Register. In 1893 the Nekoosa Paper Company constructed a sawmill. Today the Domtar Paper Mill continues the tradition of paper manufacturing. Town of Saratoga, Wood County Wisconsin, Comprehensive Plan 2007-2025, August, 2007, www.saratogawisconsin.org, accessed July, 2014.